M3 Rebecca Slim Fit Lab Coat —New! First lab coat that I didn't need to send for alterations. Fits well in all dimensions. Good quality fabric. Very professional appearing and flattering cut. Quality of material and make is excellent. We’ve spent years on research and development testing a proprietary technology on the fabric interior to keep you cool, dry and comfortable, with a fabric exterior that repels fluid, soil, and stains. 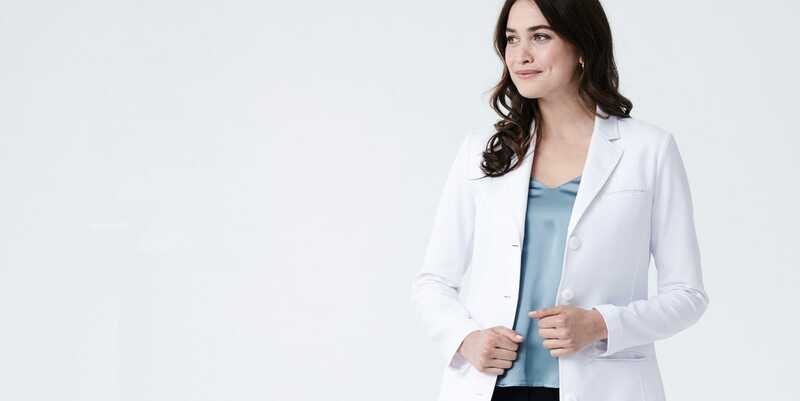 Our women's lab coats have the highest possible rating in the industry when tested for strength, soil release, and fluid repellency, which is why we proudly back up our warranty for a full year. I love this coat! It’s nice to finally have a white coat that actually fits my body and is flattering. It’s also versatile looks great with dress clothes and scrubs. The quality is also amazing, lightweight but durable. I love how confident I feel when I am wearing a Medelita lab coat. Comfortable. Material breathes so after a long day I don’t feel sweaty. This lab coat exceeded my expectations. With a phenomenal chic fit and fluid repellent features, I couldn’t ask for better! So many compliments from other providers! I absolutely love this white coat, from the perfect fitting, to the design and even the wrinkle free material. It makes me feel so feminine and sophisticated when working in the medical field. I can't wait to use it during my rotations as a physician assistant student. The entire process of ordering the white coat was super friendly, the delivery and the efficiency of the the Medelita team was above what I had expected. I love this company and I cant wait to buy more of their products. Good quality material but way too baggy and I bought an extra small. Love the Medelita Lab Coat! This coat is my favorite I have ever had. From now on, I will only use Medelita White Coats. Slimming, flattering for women, chic, durable, and comfortable for all day wear. Great choice! Q: Hello, what size is the model wearing? Thank you. A: Hi Ashley, thank you for taking the time to write us a question. The model is wearing a size 0. Please keep in mind that all garments do not fit two people the exact same. We encourage your to try on the garments and take advantage of the free returns and exchanges if you reside in the US. Q: Can anyone comment on the pocket style with this coat? I'm wondering if the flap gets in the way when you're constantly putting pens, paper, pad, stethoscope etc in the large pockets. It looks like the flaps can be positioned it or out of the pocket and am curious if this is practical. I work in the ER and am constantly putting stuff in my pockets and don't want the flaps to be in the way. A: Thank for taking the time to write us a question. The pocket flaps should not interfere with your active work life. The lab coat has been tested in our office, but not as an active Emergency Medicine Doctor. I would recommend trying on the lab coat at home and placing your normal amount of note pads, pens, tablet, stethoscope, ect. in the pockets to ensure they will work for you. Thank you for the excellent question. The Ellody and the Rebecca are very similar in length and overall fit. The Rebecca is going to be a slim fit so the sleeves will not be baggy they will have the tightness you are looking for. The length for both lab coats are identical. The bust and hip measurements are within an inch of each other, so the fit is similar. All of the garment measurements can be found in our size guide under garment measurements. A: Hi Daisy, thank you for taking the time to write us a question. We highly recommend using Oxy Clean for any stains and for detergent. Oxy Clean is safer than bleach and keeps the garments a brighter white while fighting stains the lab coat may have occurred throughout the day. Tumble dry the lab coat and hang after placing in dryer for all the wrinkles to fall out.